And she’s not far off the mark. Oats are incredibly good for you, as are bananas. Oh, and dark chocolate has health benefits too. Also, the smell of these baking is intoxicating. Neighbors may knock on your door offering to lend you money. Kittens, bunnies, and deer may peer in your window. Children will offer to wash your windows for free. But they do smell incredible. 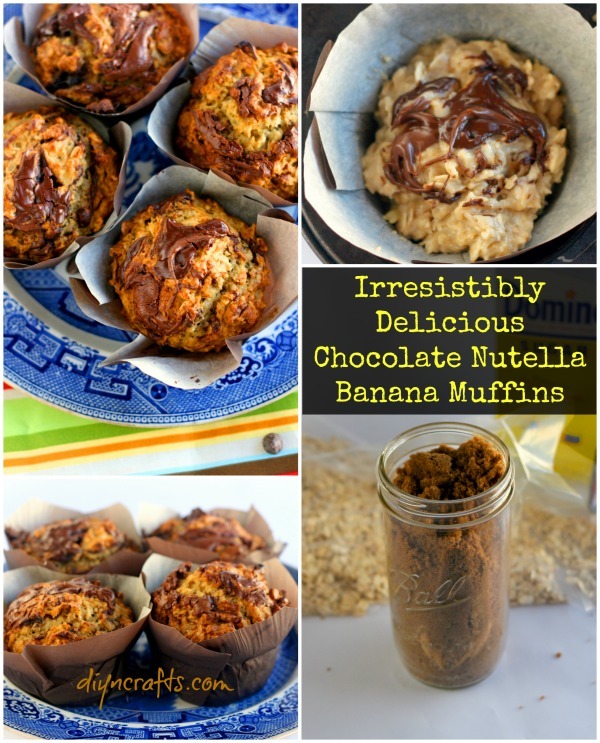 Make these for breakfast and be prepared for a good morning. Place muffin liners in muffin tin. In a large bowl combine the flour, oats, brown sugar, granulated sugar, baking soda and salt. Stir well. In a separate bowl, mash the bananas. Add the whipping cream, oil, orange juice and vanilla. Whisk well to combine. Add the wet mixture to the dry mixture and stir well. Divide the batter between the 6 muffin liners. In a small bowl, microwave the chocolate chips for 30 seconds. If the chocolate isn’t completely melted, heat for another 30 seconds. Stir well. Spoon 1 teaspoon each of nutella and chocolate on the batter. Swirl in using a toothpick. Bake for 20-22 minutes, or until a toothpick inserted into the center comes out clean.